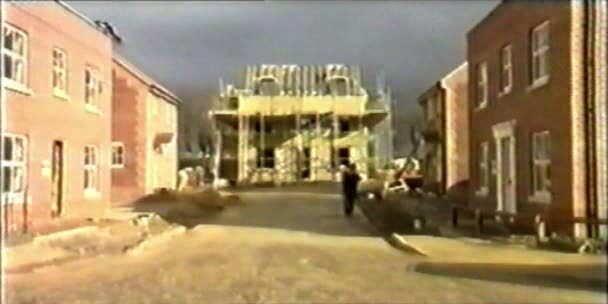 British helmer Patrick Keiller’s third feature, The Dilapidated Dwelling (2000), constructs its discourse around the housing industry in Britain. Examining how buying a house in England is becoming an increasingly expensive affair – at a time when capitalism, ironically, provides us with every facility to bring the world inside our homes – Dwelling presents an elaborate critique of modern British architecture, while branching off into other directions as well. Keiller seems to have found in the housing system some sort of blind spot in the economic logic of late capitalism, wherein its claims – apparent freedom of choice for the consumer, predictable demand-supply-price relationships and total automation – run into dead ends. Taking off from this, Keiller investigates the work of Buckminster Fuller, whose futuristic designs for mass-produced houses could never see the daylight, in order to find out why automated housing systems – such as in Japan – could never make it in the West. Unlike any of his other films, Keiller uses interviews and news reels in Dwelling, making the film more conventional and streamlined than his other works. But then, facets that pretty much define Keiller’s cinema, like the love-hate relationship between image and sound (Keiller’s images always seem to float feely underneath the tight textual fabric), moods and surfaces, the private and the public, the visible and the intangible, psychology and sociology (abandoned in the later works), the aesthetic and the ethical (the paradoxical narratives of his early short films), literature and cinema (his cinema is, in a way, about the corresponding advantages and shortcomings of both), also mark Dwelling, which explores the intertwined relationship between social and domestic formations and which attempts to rethink spaces – national, ideological and domestic. This sounds like an interesting take on something that may seem very dry. I’d never heard of this film or Director but the way you’ve described it here makes me think that I’d like it. Keiller sure is a challenging, intriguing filmmaker. I think he’d be of considerable interest to you, given that his films are doggedly about the country you reside in. Interesting Srikanth, that you’ve considered an eleven-year-old film here, which I’m assuming just now got it’s official release? And if the economic situation in the UK (or elsewhere for that matter) surrounding the purchasing of homes was as suffocating as it was in 2000, I am wondering if the situation has further intensified now. In the US we have similar excess in urban areas like NYC, and the ideas of Buckminster Fuller have manifested themselves here in endless construction of town houseas and condominium complexes, all looking blandly alike. There will come a point when consumer demand will evaporate. Terric work and unearthing here. No, not really. THE DILAPIDATED DWELLING is one of the films of the director that impressed me very much. His latest film, ROBINSON IN RUINS (2010) is a beautiful, immensely challenging work that would take a few viewings before one can begin to appreciate, I think.